Hey guys! I know…I said I was going to take a break from blogging, but I just can’t now that I know how this whole “mobile blog” thingy ma bob works! Thank you WordPress for iPhone! 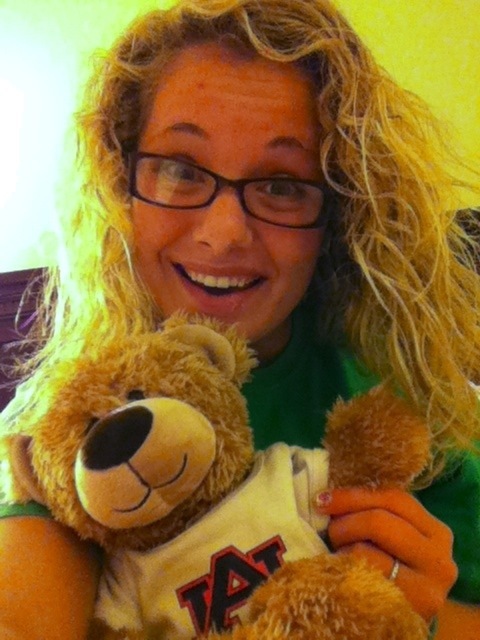 So I got a new teddy bear today at Build-A-Bear (yes, I’m sixteen and go to build a bear! All the cool gals do;)) and named him Vinny in honor of my blog Vintage Inspired Passionista. Vinny is proudly sporting a soft, snuggable coat with a fabulous Auburn t-shirt! PS: Ziva, please do not eat the eyes off of this teddy bear:( & I miss my giant schnauzer baby already!